Mercer Union is pleased to present a group exhibition by Lucy Hogg (Vancouver), Tulsa Kinney (Los Angeles) and Ron Terada (Vancouver). All three interrogate their own relationship to several variations on painting’s histories. Hogg paints monumentally scaled versions of the eighteenth century French artists Antoine Watteau’s paintings, Gilles, in highly chromatic and overpainted hatching, Kinney paints the exclamatory remark “poppycock” in an extravagant range of typographic gestures on scraps of plywood and Terada mechanically renders personal ads on an elaborate painted ground of up to 80 coats of glazing. These artists each reiterate their motifs through seemingly endless procedures that are playfully unsettling, suggesting a charismatic individual presence. Lucy Hogg teaches at the Emily Carr College of Art and Design in Vancouver and has exhibited at the Vancouver Art Gallery, Pitt International Gallery, YYZ Artists Outlet and Or Gallery. Tulsa Kinney is a painter and performance artist from Los Angeles, California, and Ron Terada is a Vancouver artist whose work was shown recently in the exhibition Young Contemporaries, circulated by the London Regional Museums in Ontario. 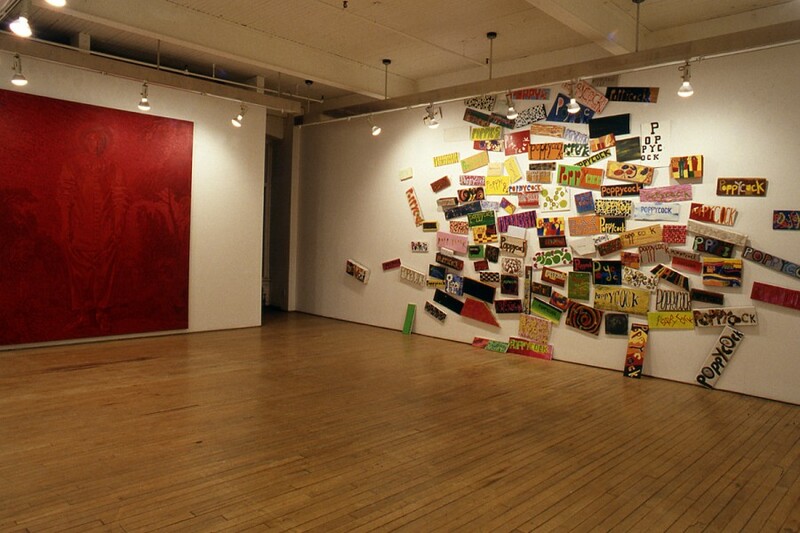 A curators talk was given by John Armstrong, Natalie Olanick and Carol Laing ,on Saturday February 22, 1997, at 2 pm. The artists were present. Tulsa Kinney’s paintings begin from an emotional experience that motivates her to paint the word “poppycock.” Poppycock means foolish talk, nonsense; even canned candy. Poppycock can be consumed, digested and expelled, stimulating the body for a length of time, yet never creating a long period of bliss or comfort. Kinney’s mimicry of a symptom of mental unrest through her art creates multiple meanings available to us through language and imagery. Sigmund Freud compared culture to neurosis; Lucy R. Lippard in Overlay equates philosophy with paranoia, religion and ritual with compulsion, and art with hysteria. Kinney’s obsessive desires are transformed into the ordering and repetition of systems and things. Fragments of distressed chards of wood are painted and arranged so that the disturbances don’t stop but go on shifting through different arrangements. 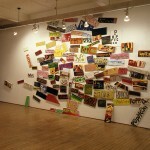 Each painting is done in an impulsive, colourful style that stages the visual reception of a word over the linguistic. 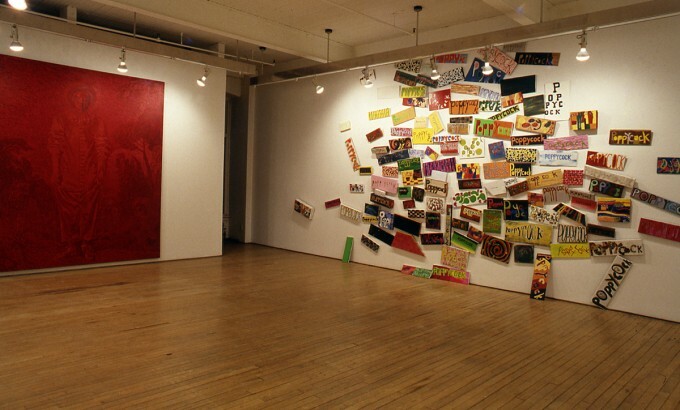 The spontaneous gestures used by Kinney in her paintings influence the hanging of the work; the installation — like a mosaic — begs a recognition of what the whole could be: if there is such a thing. From the early 1990s to the present day, Vancouver artist Ron Terada has worked on intimately scaled and fastidiously rendered paintings that incorporate a variety of found texts. 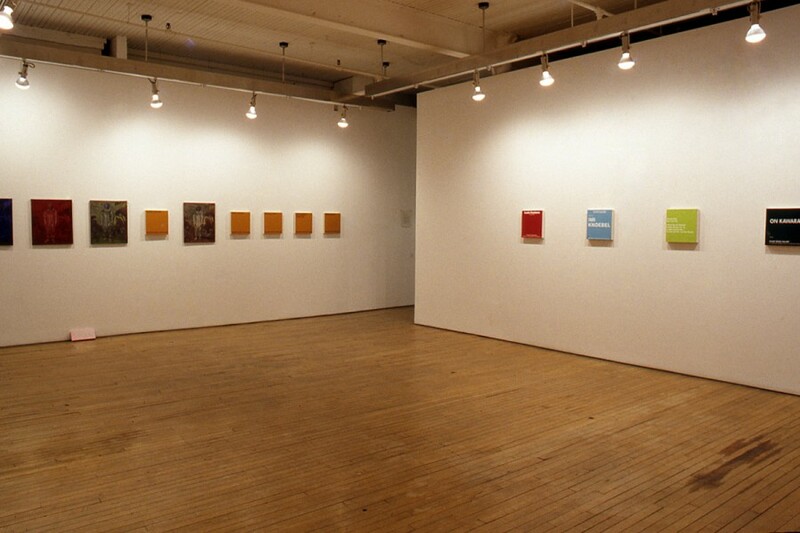 His sources have included the personal ads from daily newspapers, typographically varied first names (principally of his friends), and, in the series in the present exhibition, advertisements for solo exhibitions in prestigious European and American private galleries culled from the endless pages of high-end publicity found in the American art magazine, Artforum. Terada specifically chooses the Artforums of the late 1980s because of the abundance of high key — and expensive — colour used in the advertisements. There is also an implicit acknowledgment of the halcyon days of international art market buoyancy associated with galleries (such as the galleries from Germany, Austria, and Los Angeles cited in these paintings) that felt moved to advertise in the flagship New York art journal at that time. The notion of a rarefied set is further emphasized by Terada’s selection of exclusively male “brand name” artists such as Terry Winters, Günther Förg, Robert Gober, Donald Judd, Lucio Fontana, On Kawara, Imi Knoebel…. This “canon” of artists is recast, if not eclipsed, by Terada’s celebration of the advertisements’ graphic design. Terada builds his paintings upon finely sanded gesso grounds that support further layers of thinly glazed acrylic medium. These coloured surfaces resemble the semi-matte quality of printer’s ink on paper, echoing their magazine sources. The typography is immaculately painted on top of the monochromatic ground using a vinyl-cut stencil process. The resulting invisibility of the artist’s hand presents a kind of veiled virtuosity that playfully acknowledges Terada’s parenthetical distance from the primary experience of either the brush or the bona fide. Lucy Hogg’s large painting Gilles is red, before it is anything else. 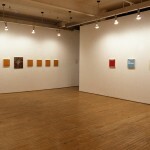 A sequence of smaller studies, each also saturated with a single colour — blue, or mauve; green or yellow — repeats and multiplies the large work’s content. Once past the vivid intensities of the different chromatic registers, there is the recogniza– bility of the stable image, common to all the pictures: it is Antoine Watteau’s Gilles (or Pierrot , by its alternate title), painted almost three centuries ago in Paris. Watteau’s work becomes Hogg’s strong armature, and one she takes great liberties in revising, overturning the near invisibility of his surface labour to foreground a markmaking that is regularly and deliberately sustained across the full surface of all her works. Still, the double-naming — and Hogg’s repeated doublings — of Watteau’s picture do not allow us to finally decide the identity of the actor; but that is not the intention of either artist. Instead, what matters more, for Hogg as for Watteau, is the self-identification of the artist as an actor, an actor who, in all these ‘curtain call’ pictures, remains singularly in costume, and purposely detached from the play. In all the images, strong claims are made by the scale of the figure for attention to be paid to the importance of the performative in life. It is artistry itself that is being celebrated. Following this reading, both artistic performances become then alternative self-portraits that mimic the improvisational actor-generated performances of the commedia dell’arte tradition, and a form of double proof that meditations on serious questions in art — especially in regard to painting — work better framed obliquely and ironically.